Chris (Christine) hatched in captivity on April 28, 2010, and was considered by the team of the Great Crane Project to be a very pretty bird. She was released 4 months later and has spent the last 3 years in and out of Slimbridge Reserve in Glouchestershire, U.K., bonding with the other birds. Chris has always been easily recognizable because of a distinguishing characteristic: "Her leg still dangles in flight, making her the only bird that is clearly indentifiable as an individual when airborne but it does not seem to impair her ability to walk or fly in any way." She took up with Monty in April and the 2 birds mated, built a nest, and chased away their friends. 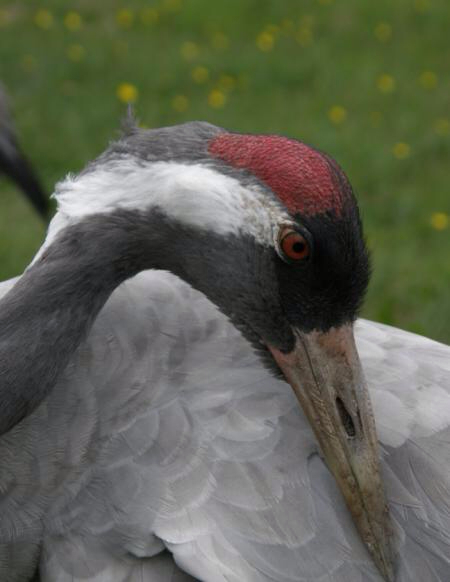 Monty – described in September 2011 as "a stunning crane" – dallied with Ruby, but settled on Chris this spring. And now they are expecting! Since it is the first to be laid in southern Britain in 400 years, the egg is being guarded around the clock. Nigel Jarrett of the Wildfowl and Wetlands Trust exclaims, "Cranes are an iconic part of British wildlife and one that was all but lost for centuries. There is a long way to go before cranes become widespread again, but it is absolutely momentous to see this egg laid at Slimbridge."